Kelly Thiel is a full-time artist, specializing in ceramic sculpture and mixed media paintings. Her award-winning sculptures have been exhibited nationally and are in many private collections. 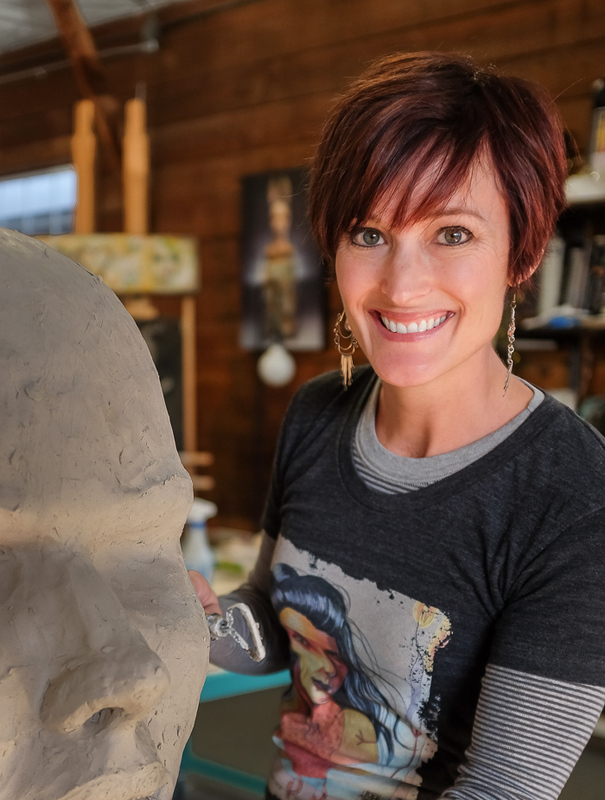 Kelly also has been featured in several magazines and books, such as The Crafts Report and 500 Figures, and was featured on the cover of the Handmade Business magazine in April of 2015. She also shows her paintings locally; these can be seen in various places around town, for First Friday and other exhibits. She shows both her paintings and sculptures in the U.S. and abroad. In 2013, Kelly began sharing her knowledge by giving back to the community through workshops at her private studio and has continued to teach on the east coast, while expanding to the west coast. She continues to teach workshops and classes, and hopes to start doing a couple of art retreats in the near future! While she will always be a southern girl, Kelly moved her family and studio to Bend in 2014 to enjoy the snow and high desert sunsets. Kelly stays busy with her art, two daughters and husband, and one snow-loving dog. Wallis Levin is a creative entrepreneur at heart. Using The Wilds as a creative platform, she has put on several curated pop-ups and food events in Bend, with the goal of highlighting the incredible local creative talent in Central Oregon. In February, 2017, she purchased Loloma Lodge, a historic property on the McKenzie River where she plans on putting on many more events (after the redesign and rebranding). In the spirit of collaboration, she is very proud of The Wilds and the members who helped brand, design, and implement new strategies at Loloma Lodge. "Collaboration, not competition" is her motto. Here are the creatives that make The Wilds the best place in Bend to cowork!